Department of Justice lawyer says more than 100,000 visas have been revoked from travellers in the past week. More than 100,000 visas have been revoked from travellers heading to the United States under President Donald Trump's travel ban, a U.S. Department of Justice lawyer said Friday, according to The Independent. The number was revealed during a Virginia court hearing for a lawsuit filed by two Yemeni brothers who had flown in to Dulles International Airport last Friday and were quickly put on a return flight to Ethiopia. "The gasp was audible in the room," Simon Sandoval-Moshenberg of the Legal Aid Justice Center, who represents the brothers, told The Independent, adding the number includes immigrant and non-immigrant visas. "I think this number is going up daily. We know someone in Iran who had an appointment at the U.S. Embassy tomorrow to get his visa and it's been cancelled," he told the newspaper. The State Department later on Friday disputed the number cited by Sandoval-Moshenberg, saying that fewer than 60,000 foreigners from the seven majority-Muslim countries identified in Trump’s order had their visas provisionally cancelled. The State Department clarified that the higher figure includes diplomatic and other visas that were actually exempted by the travel ban, as well as expired visas. Trump’s executive order, issued last Friday, banned all persons from Iran, Iraq, Libya, Somalia, Sudan, Syria and Yemen from entering the U.S. The ban is effective for an initial and extendable period of 90 days. Hours after the order was issued, refugees from the seven countries reported being turned away at foreign airports while those who made it all the way to the United States were detained upon landing. 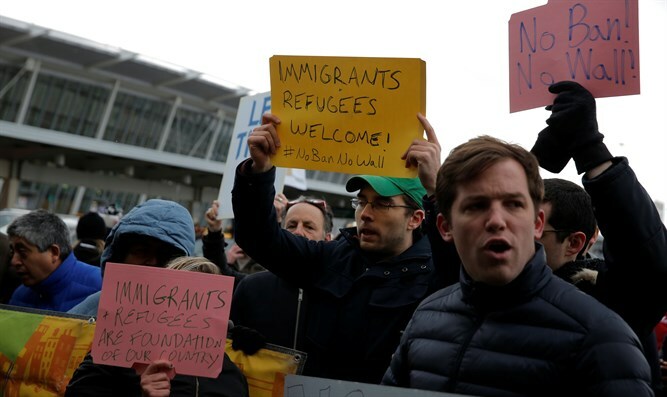 The American Civil Liberties Union (ACLU) later appealed the executive order, and four federal judges subsequently ruled against it, staying its impact on people who were detained at U.S. airports over the weekend. (Arutz Sheva’s North American desk is keeping you updated until the start of Shabbat in New York. The time posted automatically on all Arutz Sheva articles, however, is Israeli time. ).